If you have been following us for a little while, you will know that we are big advocates of weekend budget trips! For many who may not have the budget for an extravagant international jaunt, a weekend getaway can be the perfect and affordable option to stretch your legs and get out of your routine. We recently took a quick road trip from Boston over to Saratoga, New York to take in the running of the Whitney Stakes at the Saratoga Race Course. Sheila was a huge fan of horse racing and got Chris into it last year (which wasn’t hard since he already enjoyed the occasional trip to the casino) and she thought it would be a perfect gift for his birthday that he celebrated back in July. We left Boston late on Friday night, due to Sheila having to work that morning. We decided it would be best to leave slightly later to avoid all the traffic on Interstate 90 heading towards Albany. Sheila had booked a hotel roughly 20 minutes away from Saratoga down the road in Schenectady, as it was significantly cheaper than the ones directly in Saratoga. (This is another one of our travel tips: if you are going to a destination for a special event, always consider accommodation that is close, but not directly near the venue or event to save!) The hotel was booked via our favorite travel app, Hotel's Tonight. She had chosen The Landing Hotel, which is a 165 room hotel with very modern and clean looking rooms. It includes a number of amenities including: a fitness center, patio overlooking the river that runs behind the property, a bar, free onsite parking in their garage as well as a spa. The best of all the amenities though is the casino that the hotel is attached to! We definitely took advantage of that on Saturday night after the races and spent some time at the blackjack tables to satisfy our fix for games of chance. You can find their info here! Saratoga is of course well known in the racing circles as being one of the most historic tracks, as well as hosting some of the most important stakes races that allow the winners a shot at the breeder’s cup later in the year. The first thoroughbred races were held in 1863 by casino owner and future congressman John Morrissey, and has continued (almost) uninterrupted since then, giving the course the distinction of being one of the oldest sporting venues in all of the U.S. This was the first race we had been to at one of the bigger tracks and were certainly surprised by just how many people there were in attendance. We were also surprised by how many families there were as well. Many people were bringing in their coolers with them, planning to spend the day simply taking in the races. There is a huge social aspect to going to the races, and we struck up a conversation with a gentleman a few seats down who was a season ticket holder. It was a good experience, mainly because we picked his brain for handicapping tips in addition to the small talk. With its history and great environment, a trip to Saratoga is well worth it if you are a racing fan, or just looking for a nice day out in a nice social environment. The track is also very family friendly, with a playground and area for kids to hang out. There are plenty of food options and local venders selling their goods. You can even bring in your own food and drink and picnic a day at the track! You can find the info for the track here! Tickets can be purchased day of at the entrance to the track or online via the NYRA and third party sites like Stubhub, Ticketmaster, or SeatGeek: we always go with the cheapest option!! After arriving around midnight on Friday night we decided to sleep in Saturday and grab breakfast nearby once we woke up. As we often do when we travel, we asked the front desk for a recommendation for a good breakfast joint and he pointed us to The Iron Roost. The Iron Roost is located a short drive from both Saratoga and Schenectady in nearby Ballston Spa. Upon arriving at their location, we immediately fell in love with the design of the space they occupy. With an abundance of natural light and a feeling of sitting down in mom’s kitchen for a home cooked meal it has the perfect atmosphere for your weekend brunching. The wonderful atmosphere is complimented by the stellar food that they serve, with their specialty being gourmet waffles. Chris ordered their early riser (your standard eggs, bacon, toast and home fries) and Sheila ordered their Brioche French Toast (which they do in their waffle iron). We love a good breakfast place, and we can say that the food here lived up to our expectations. Everything was cooked perfectly, incredibly flavorful and super fresh tasting. We actually loved the food and the incredible service so much we went back again the next day and tried some of their other specialty waffles, specifically the Banana Foster and Lemon Berry! We would definitely recommend stopping by the Iron Roost if you are going through the Albany area, as it is only a little more than a half hour North and definitely worth the time to stop in. They are open 7a to 2p, Tuesday through Sunday. You can find their website here! And let them know we sent you!! After our trip to the races on Saturday, we decided that on our way back to Boston that we would stop by a few of the local wineries to do some tastings. The first one we stopped at was the Saratoga Winery. Their property is situated a close four miles west of downtown Saratoga, consisting of their tasting room as well as a wonderful outdoor patio and grass space that hosts live music on the weekends, as well as being available for rental. We instantly loved the design of their tasting room, with the whole building incorporating a rustic ascetic that included wood carvings and stone work, which would bring to mind a cozy cabin in the woods. Wine Tasting Flights come in this spiral carrier all in one serving! The winery produces a variety of oaky to sweet white wines, as well as a variety of red and red blends with their grapes that are grown in the Finger Lakes region of New York. Their specialty though, is their Melomels. What is a Melomel you ask? Well it is a combination of both wine and honey, that is then aged in a bourbon barrel. Having never tried a Melomel before, we can say this alone is worth the trip to visit. The Melomels reminded us of a dessert wine, but with a bite more substance due to the slight hint of the bourbon and less of a sugary taste due to the natural sweetness of the honey. Tastings start at $5 for five wines ($8 if you want to keep your glass!) and all of their bottles are for sale if you find one you can’t go without! The winery also partners with a little food shack that sits on the property that allows you to get flatbread pizzas! Not feeling wine? Well don't worry they serve mimosa flights for $20, to enjoy on your Sunday Funday!! You may be wondering, “Why is there a brewing company in a list of wine vineyards?”. We actually stumbled across Racing City from our google search for wineries and when we arrived we were a bit surprised as we were expecting Olivia Vineyards. It was a pleasant surprise though, as Racing City and Olivia Vineyards are actually associated. Both are owned and managed by a gentleman named Tony Olivia and his wife Debreen. As racing enthusiasts, we absolutely love the space that they occupied. They pay homage to the horse racing history of Saratoga with the menu designed to look like a racing sheet, many of the beers and wines named with a horse racing angle, and even show many of the races on the TVs in the tasting room. It makes sense though, given their location is only about a ten-minute drive to the race track and the Olivia family also owns a stable that has registered wins at some of the best-known tracks (their horse Italydar is both featured in the silhouette of their logo and has one of their wines named after him). You certainly aren’t spoiled for choice with 12 brews, 4 wines, and 3 cocktails on offer. We were tempted to try some of their beers, but as we had been drinking wine all day we figured it was best to keep it consistent. They offer flights of both their beers and wines in samples of 4 for $8 and we decided to give all their wines a try. They offer a peach wine, a Riesling, an off-dry white, and a dry red. We did enjoy all of them but were particularly fond of the peach wine and ended up getting a bottle before we hit the road. They do also offer some small pub food options, and we got both a pretzel and tacos (that were brought out by Tony himself). 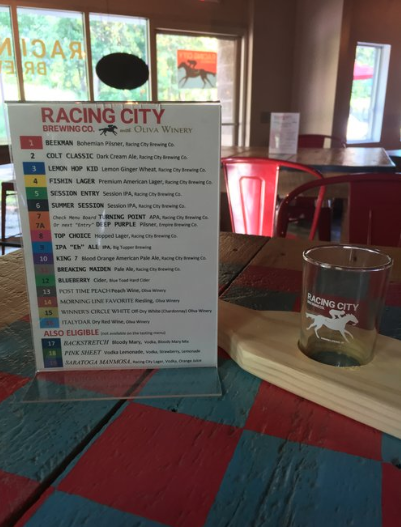 Overall, we loved our stop at Racing City Brew Co. because of how well they incorporate the horse racing element into their overall theme. It’s a perfect place to head for if you are in the mood to handicap some races while drinking a brew on a weekend (there were actually two other customers doing just that at the bar when we stopped in). It is also a great choice if you are a beer enthusiast but may have someone who doesn’t drink beer in tow. With the options for both wine and cocktails, it should satisfy everyone’s tastes. Victory View was the last vineyard we hit on our way back to Boston and we were very glad we did! We arrived about an hour before closing and were the only people there when we walked in and were greeted by the vineyard owner, Gerry Barnhart. While chatting during the tasting Gerry filled us in on how after a successful career with the New York State Department of Fish, Wildlife and Marine Resources, him and his wife Mary decided to follow a new passion and established a farm winery using hybrid grapes from the University of Minnesota and Cornell. All the grapes are grown, and all the wines are aged and bottled on the property. In addition to telling us the story of how the farm and vineyard came to be, he gave us a little bit of the local history as it related to the Revolutionary War events that occurred in the area. The vineyard itself gets its name from the view it has of the Saratoga National Historical Park, the site of the Battle of Saratoga (victory…. view. Get it? ), which is only a few miles away. Many of the wines are also named for historical figures or themes of the war. The vineyard produces a variety of reds and whites that are sure to satisfy any oenophile, as both us enjoyed everything on their tasting menu and ended up staying to enjoy a full glass while taking in the sunset from a pair of Adirondack chairs. The tasting room is open April to December on the weekends, noon to 6pm and offers a tasting of six wines for $5. You can also get wine by the glass for $5. We enjoyed our visit to Victory View immensely, in large part to the passion that Gerry and Mary have for what they do there. It comes through in every aspect; from the vineyard, the tasting room, as well as the deference that is given to the local history and community. From the moment we walked in it felt as if we were being welcomed into someone’s home, and we would encourage everyone to stop by and experience it for themselves. Want to see a bit of what the trip was like and where we are off to next? Make sure you follow us on Instagram and Facebook . This is the best way to stay up to date with our adventures, learn new tips and tricks and see what we have coming out next!